InterPoker was launched in 2001 and most casino players may recognise this brand through its association with InterCasino. Despite this link the dull and simplistic visual interface at InterPoker made this online poker room a less desirable option for poker players. Since 2005 the InterPoker room has been transforming and the stability and functionality of the software has attracted a lot of traffic to the tables. Although the variety of games remains relatively low, one of the most popular games at InterPoker which attracts a lot of players in the poker room is Texas Hold’em. New poker players can take advantage of the soft competition at InterPoker tables to help them learn more about the games with lower stakes. There are also recurring monthly bonuses and guaranteed prize pools to the value of $4 million. InterPoker does not provide visually appealing graphics and used to be referred to as the ugly duckling of online poker rooms. However the lobby is easy to navigate and the software is fast and reliable with a slower game speed which allows players to multi-table and to play more hands per hour. The settings incorporate customizable features which allow you to adjust colours, dealer voices, player location, card animations, , bet amounts and hand values. The game view history is a useful tool which helps you to keep track of the hands that you have played recently and to assist you in managing your bankroll more effectively. InterPoker offers a mediocre game variety which includes Omaha Hi/Lo and Omaha in Fixed and Pot Limits, Texas Hold’em is available in Fixed Limit, Pot Limit and No Limit. Texas Hold’em players can enjoy the heads-up game which is also available and the big stakes tables of up to $300 for fixed limits and up to $50 in no limit are a definite plus. InterPoker has managed to attract a significant number of real money players with over 3500 players during peak hours and over 70% of this player traffic found in Texas Hold’em tables. 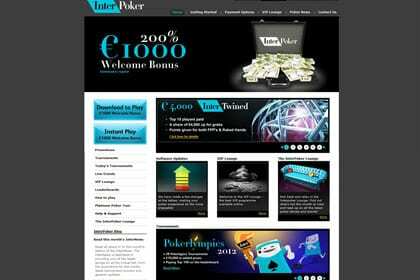 InterPoker is considered one of the best online poker rooms in terms of providing soft competition. It is ideal for new players trying poker for the first time or for players who prefer to play at medium stakes level. There are several exciting tournaments at InterPoker such as Sit’n’Go tables for Texas Hold’em and scheduled Texas Hold’em games. Popular events include the Irish Poker Open, the CAPT Austria and the Head-hunter Series which rewards players through the elimination process. At InterPoker you can claim the sign-up bonus of 100% up to $150 and a $500 reload bonus. The InterPoker “My Player Points” are loyalty reward points which can be earned through cash games. The InterPoker Hot Spot League is a popular promotion which rewards players with a $600,000 prize-pool which varies depending on the season.